We’ve all heard of meditation, and, for us Christians, it can sometimes be a bit challenging to separate the secularized image that can go along with it. Sure, we know that silence, prayer and a calm heartbeat can be a much more practical scenario to receive His blessings through the Spirit. But how can we do this in this modern age? The answer seems to be through the Mindscape Christian meditation application, available to you through the iTunes App Store. With this handy software, you can put your iPad to good works by centering your thoughts on Him. 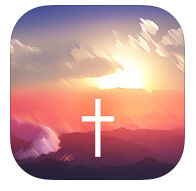 Focus on your scripture of choice and a soothing virtual setting and begin your connection to the Lord. 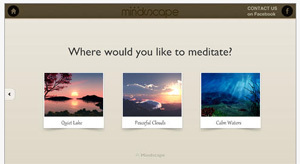 Take a break from browsing YouTube on Safari and download Mindscape Meditation; both a free and paid version is available. To start begin by clicking the app on your main screen. The app will instruct you to get a fresh revelation, and when you click the start button you have three beautiful, and familiar, settings to choose from. I love the skies, so I chose “Peaceful Clouds.” Have a lot of time? Choose to meditate for 30 minutes, or cut that down by a third if you are on a quick break from work. Now comes the interactive part: multiple topics to choose from and, within those topics, you can find recommended quotes from Scripture. I chose “Healing” and “Isaiah 53.5.” The first time through, I recommend to use the voice guide (it will prompt you to turn it on) so you can follow the meditation exercise as it was intended. From there, you should be a pro with the app, and you can just sit back and listen to the sounds, watch the beautiful visions and allow the Word of God to inspire you into a calm and productive day centered on Him. Technological perspective: The navigation was easy and excellent. Easily go back a screen as if it were a browser. Even end a session early by tapping on top of screen once to find exit button (you won’t find you will want to end early). Plus: e-mail the scripture and share your experience when you are finished with a quick link provided to you by Mindscape. Overall, the overarching theme of this app were the sounds and imagery, which shows how what He created can be used for good. All is His creation, and so He gave it to us to use for good works. In this modern time, we can combine this and His Word with technology – and so the Mindscape Meditation app performs His will with our brothers and sisters in Christ. Click below to download this now to your iPad!